The Dark Knight. The Caped Crusader. His unique lore has transcended mere cultural fame to become something essentially American. He’s the more complex, fragile, and real side of American heroism. While Superman is the hero everyone wishes would save them, Batman is the frightening hero we deserve. 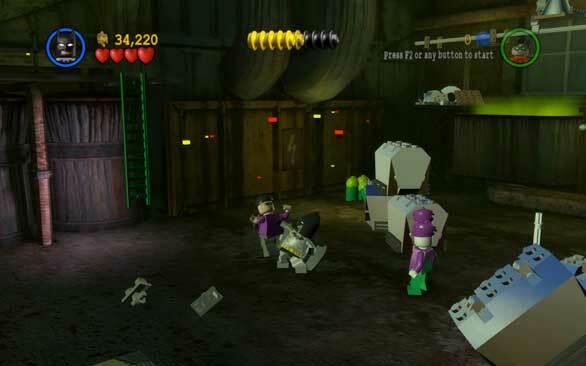 But I’m not sure what we, as a society, did to deserve Lego Batman: The Videogame. 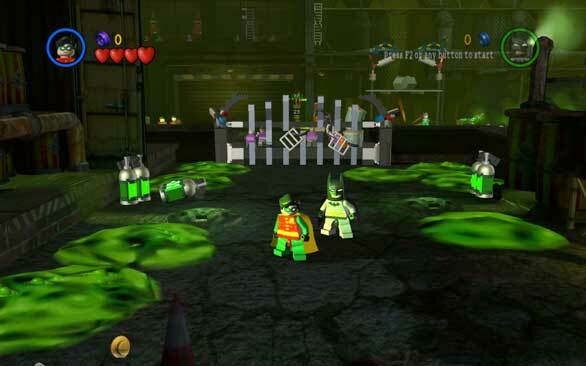 I’m a big fan of the Caped Crusader, and as I’ve shown in previous reviews, I enjoy the cartoonish violence, simple combat mechanics, and challenging puzzle/platforming formula of the Lego series. To a point. The problem with Lego Batman is that it doesn’t do anything the other entries in the series haven’t already done (and better). Perhaps getting complacent, the developers have thrown another franchise into the lego-game-o-matic and hoped to get similar results. If it wasn’t already abundantly clear that the game’s developer, Traveller’s Tales, seems to have gotten lazy by trotting out another entry to the Lego series, upon playing Lego Batman you realize they haven’t fixed anything that plagued the previous Lego entries. Vehicles are still ghastly to maneuver, though now they have segments where you have to control vehicles down alleys or through canals, and have added camera problems to the difficulties. The kid side of me was psyched I got to pilot some pretty cool Lego sets, but the game reviewer in me is beginning to suspect that this series is more interactive toy commercial than game. It’s hard to strike fear in the hearts of criminals when you’re a two-inch piece of plastic with pathfinding issues. Similarly, the respawn formula hasn’t been fixed (if you die in a spot, you’ll likely respawn at the same point and get caught in an infinite death loop) but I’ve gotten better at pressing the K key on the keyboard and switching to the other character in time to avoid this game flaw. You control Batman and Robin as they confront three chapters of crime fighting. 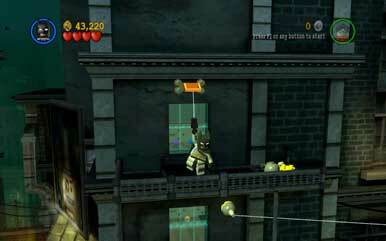 Adorable Lego Batman and Robin each have grappling hooks that can be used on certain blocks to climb up buildings. They also have boomerangs to disarm foes from a distance, and each has a variety of fighting moves that will easily (perhaps too easily) take out baddies. Dozens of villains from the comics face off against you, from classic bad guys like the Joker and the Riddler to more obscure entries like Bane and the Man-Bat. Fans of the comics will appreciate unlocking characters like Nightwing and Scarecrow. After you complete a particular chapter as Batman and Robin, you’ll unlock the corresponding villain chapter. While Batman and Robin have a variety of suits to augment their abilities that can be discovered and switched throughout the levels, the villains each have their own unique powers. Poison Ivy, for example, can double jump, throw poison, and is immune to toxins. While I found playing with Batman and Robin boring and their suit switching clunky, the villains have complimentary and approachable powers. It’s simply more fun to be evil and commit crimes rather than stop them. I enjoyed seeing landmarks from the comics like Gotham Zoo and Arcam Asylum in brick form, but it’s a shame that the missions (hero and villain) are boringly similar, and follow the same repetitive formula. Your enemies are different, as are your powers, but the environments and gameplay are fundamentally identical. It’s a real opportunity missed, because the villain missions were a good opportunity to differentiate Lego Batman from the rest of the Lego series. Instead, all three chapters (and corresponding villain chapters) have the same punch-every-brick-in-sight approach to discovering solutions to puzzles and are frustratingly limited to an almost 2-D side-scrolling plane. The puzzles aren’t as clever as Lego Indiana Jones: The Original Adventures ( ) and don’t require as much coordination between characters. When you do switch between characters, it will likely be during a segment when you’ll need to change your character’s suits, a good idea in theory but the switching back and forth is an annoying distraction by level 2. Some solutions to puzzles seem poorly implemented into the world too. After searching around for ten minutes for a way to pass a river of toxic waste, I figured out I had to break the top glass panes of a building and then jump on the flowers to summon a solution. I must have missed that one from the comic books. In the end, the overarching experience feels repetitive and the story’s narrative is nonexistent. While Lego Star Wars and Indiana Jones could rely on the plots of the movies to break up the action and move the story along briskly, Lego Batman tries to offer a compelling crime saga while throwing in just about every Batman villain possible. I don’t entirely blame the developers on this. While Lego Star Wars II ( ) and Indiana Jones could rely on the player’s memories of the movies to fill in any gaps in the plot, players can’t do so here because we simply don’t know what’s going on. The lack of dialogue, a Lego series hallmark, is also working against the story here; every cut scene involves at least one character falling down in an aw-shucks moment while someone plays the straight man. We’ve seen this light-hearted comedic slapstick before, but it falls flat here. I can only laugh at Robin falling down so many times, dammit. Feral Interactive ported Lego Batman to the Mac, and on my 2.66GHz MacBook Pro the little Lego versions of comic iconry were rendered with adorable detail. I doubt this will be the last entry of the series; PC World’s Darren Gladstone has some creative suggestions on how to breath new life into the Lego series (I, for one, am hoping for Lego God of War). After you play through the first chapter with Batman and then play the equivalent stages with the villains, your child-like mirth wears off and the game boils down to its stark reality: it’s a repetitive platformer with limited combat, uninspired puzzles, and a difficulty curve that resembles an EKG line. Kids will still be drawn to its many character cameos, mixing of Lego and Batman worlds, and silly (if overdone) humor. It’s a shame this is the least inspired entry of the series, but it’s still better than Lego Superman ever could be.